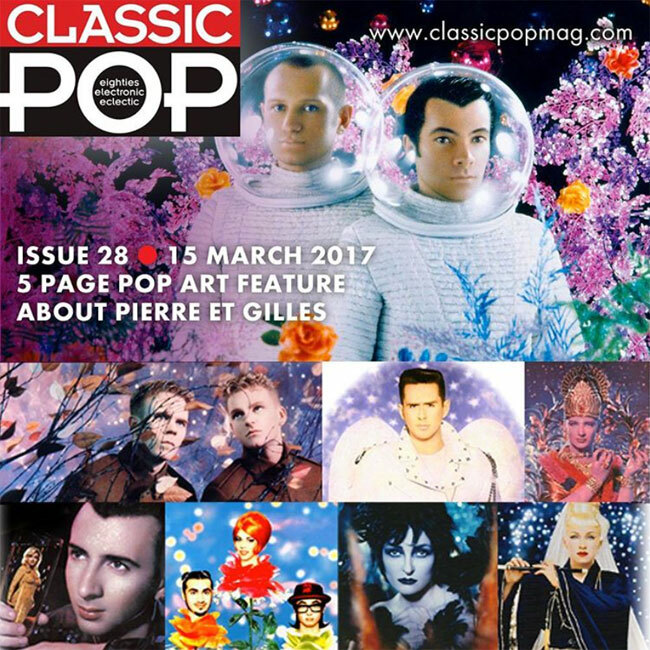 Andrew was also kind enough to share some excerpts from a feature on the talented French design team of Pierre et Gilles he wrote and published recently in issue #28 of the U.K.’s Classic Pop magazine. Partners in work and in life for over 40 years, the duo has collaborated – and partied hard with – celebrities and those looking to the pair to create memorable images that might launch them into celebrityhood. Along the way, they’ve used their talents in painting (Gilles Blanchard) and photography (Pierre Commoy) to produce unique covers for records by artists including Erasure, The Creatures and Marilyn Manson as well as French acts such as Mathmatiques Moderne and Amanda Lear, so I hope that you enjoy this tidbit and will turn to the magazine soon for the full meal.